sheep dreams: What's making me happy* this Monday? What's making me happy* this Monday? Some of my friends are going to totally get this and some of you are going to think, "Huh?" This hunk of machinery is what's making me very happy on this Monday. Mike and I went shopping together on Saturday morning (and that is more than rare, it practically never, ever happens) and this is what we bought. I drove the truck and trailer to town this morning, loaded this baby up and now she's all mine! I told Mike I was pretty sure there weren't too many women who would be so thrilled to be spending money on anything called a Dixie Chopper (unless it was a major kitchen appliance and even that's a little iffy). She's going to make one of my jobs around here a whole lot easier and faster. I hope she's the last big mower we ever have to buy. One more thing that's making me happy today - iced coffee. I finally weaned myself from Diet Coke a while back (though I'll confess to a few slip-ups while on the road to and from New Hampshire) and find I'm really missing a little caffeine pick-me-up in the late morning or mid-afternoon, especially on these hot, humid Kentucky summer days. I noticed several people pinning iced coffee recipes on Pinterest lately and decided to try it for myself. I generally don't drink coffee, especially in the morning. It somehow feels too acid-y for my stomach. One of the things people kept mentioning was that cold-brewing makes the resulting coffee much less acidic. I did a little test run last night by putting a partial bag of Fresh Market Hazelnut Cream coffee in cold water and leaving it on the counter overnight. This morning I strained it through coffee filters several times and then refrigerated the concentrate. I just prepared my first glass by adding some sweetened condensed milk to half a glass of coffee concentrate and pouring it over plenty of ice. Oh, my....I think I'm hooked! (and, am I the only person who's never tasted sweetened condensed milk before? Seriously, where has this stuff been all my life? Given that we've cut way, way back on processed foods and sugar, I can see that I will need to be careful with this concoction!) Anybody else tried this? I love iced coffee all year. I've used the Toddy Cold Brew Coffee maker, which has a filter so you don't have to strain it. You just leave it to sit overnight, then pull out the bottom plug and let it drain into the glass pitcher. I found it wasn't as strong as the instructions said. I didn't need to dilute it with water. Honestly, this has opened up a whole new world for me! Obviously, I live a very sheltered life! 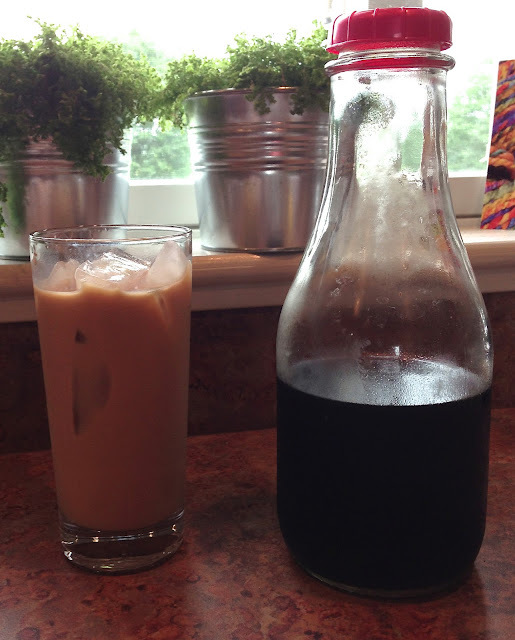 I haven't tried the sweetened condensed milk but I have used the cold-brew coffee concentrate. Delicious! And even though I don't live on a farm I have always fantasized about having a ride-on mower! Go girl! Pretty sure you can't go wrong with sweetened condensed milk... Congrats on the mower :-D.
That is one serious mower!! Does it have cup holders for your iced coffee? You could probably ride that dude to town, and get groceries. Does it come with a cart for the back? Just think---you and your favorite bottle lamb in the back cart riding over to your knitting meeting!! Pictures please!! I'm so jealous of your Dixie Chopper!! I still chug along on our 42" John Deere. Such a drag to turn . . . Congrats! !